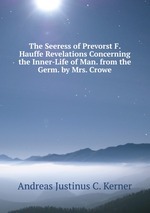 Аннотация к книге "The Seeress of Prevorst F. Hauffe Revelations Concerning the Inner-Life of Man. from the Germ. by Mrs. Crowe"